So I had a real talk with myself about whether or not I was going to make this post. After starting my Amateur Guide series, I had often thought about what other travel related posts I could write. I still feel a bit too amateur to really go into specifics about things, and only feel comfortable telling you what I have learned from travel rather than being the ~travel guru~. That being said, I’ve already learnt so much from the little travelling I’ve done. And so I wanted to share with you my travel essentials; things I’ve realised I need, things that have been so helpful, and things I’ve forgotten in the past and seriously regretted! When I think about packing for a trip, I just want to have a little cry. It is honestly the most boring thing you can do when it comes to planning a trip. I love figuring out where I’m going, where I’m staying, learning the basic phrases in a new language. But packing? It’s not my cup of tea. I’m bad at it, and I’m very forgetful and often have to buy things while I’m already there. It costs to forget stuff, so before I even think about putting something in a suitcase, I start a list. Clothes. Appropriate clothes that I will wear more than once. I might take another pair of shoes but usually I stick with a pair of Doc Martens or other thick and sturdy shoes. I do a lot of walking on my travels, but this is obviously different depending wear you’re going. If you’re going somewhere with a beach, take flip flops! Towels. This could be just the one, but I like to have a big’un and a littl’un. Sometimes the hostels I stay in only provide towels if you’ve paid extra. For a broke amateur traveller, that doesn’t sit well with me. However, if you’re staying in a hotel or Air BnB, they usually provide them! Travel documents, money, passport. If I didn’t take these I think I would be too amateur to travel! Straighteners. Probably not an obvious thing and not too essential. But I just like to have them with me since hostels don’t usually provide, yet they sometimes provide a hairdryer. Plus, you’ll be everyone in that girls’ dorm’s best friend! These are the things that fill up most of my suitcase. Everything else? Small, but essential bits that make the trip easier, nicer, and stress free! I realised whilst packing for Copenhagen that carrying a lot of stuff was really going to bother me. I wanted to keep it to a small suitcase and my backpack and was a bit nervous that I wouldn’t fit everything in, especially since I have make-up and hair care and skin care products. I didn’t want to over pack; I liked the idea that I can just get-up and go with things that may not be needed in every day life, but a necessity whilst travelling. One of the things that helps you with that is the 100ml limit of each liquid you carry on board a plane. This doesn’t count when you have luggage in the hold, but remember! A broke amateur never pays for space in the hold! And so I’m forced to really downsize my makeup and my whole wash bag kit. However, this does NOT mean buying ‘travel size’ items. They’re always more expensive than the larger size, even if it doesn’t seem it at first, you’re not getting enough for your money because they know you have to buy it if you want to take it with you. Yes, everyone has that one product that you just have to have with you and can only buy a travel size version of such as aerosol cans (for me it’s dry shampoo), but for everything else, there’s small, empty travel containers! There’s so many different shapes and types of containers that can fit your needs. You can use them for much more than I do. Some have spray handles or pumps. I’m thinking of getting a small one for toothpaste. I have a super small toothpaste at the moment, but after I use it all, I don’t really want to buy another one! But it also means that I don’t have to spend loads of money on little shampoos and little creams when I can just put my own in these reusable containers! I’ve also gotten a little obsessed with foldable things. This includes foldable hairbrushes. You know, the ones that you used to receive in a gift bag after a birthday when you were a kid, or you won out of a Christmas cracker? It folds and pushes out into the shape of a normal hairbrush, but takes up much less room. Also pictured is my foldable toothbrush, which I haven’t used for travelling yet and I’m kind of nervous because when it’s completely folded it looks like a switchblade. Oh well, I’ll let you know if I get stopped at security because they think I’m carrying a weapon! Now that your wash bag is nice and light, it’s time to pack the things that make your travels that little bit more pleasant and smooth. As I like to take as little as I can with me, I do find it hard not to accumulate things like this. You know, little things that you might not need and could potentially get lost in your many, many bags. But I find that having these brings me a little more comfort. And hey, they’re also things that if you find you don’t have them, you can pick them up at a pharmacy, convenience store, or petrol station! Earplugs. These are great for when you’re staying in a hostel, but they’re also good for overnight trains, and long plane journeys. I tend to lose mine, so it’s best to get the ones with a little snap shut box included, rather than ones that come in plastic packaging. Sleep mask. For all the same reasons as the earplugs, but I would only wear it if I was going to sleep on a plane or in a hostel. I hate sleeping on public transport because I always worry that I’m going to miss my stop. Wearing a sleep mask will make it more likely! Great for when someone still has a lamp on in your hostel dorm, or if you’re on a plane and feel sick and the lights are too bright and you wanna die. Headphones. But the small kind. I’ve taken my large over ear ones before and it was a big mistake. They take up too much space. Little ones that you can wrap in a loop and store in a bag’s pocket are perfect enough. Hand sanitizer. Look, things are gross ok? Train station toilets. The little ‘stop’ buttons on buses. Theme parks. Nightclubs. DIRTY. Just a little hand gel, that’s obviously 100ml or under ,will go a long way for you. Your friends will also love you. Padded plasters. I had never thought about this until my last trip to Stockholm. My travels usually involve me walking around cities (which I’m hoping to shake up soon) and my go-to shoes are my Doc Martens. Docs are great; they go with anything, are nice and sturdy, and STILL haven’t broken since I got them when I was 17. However, I do need to wear them with thick winter socks because they are just that little bit too big. Turns out, that ain’t good to my heel, and so the blisters begin. When you’re in that situation, all you want to do is elevate your feet and never walk again. But there are places to see! People to meet! Cobbled streets to walk! Get padded plasters, they are cushions for you feet. And yes I will wear better shoes thanks MUM. Kindle. You’re reading a book blog right now, why wouldn’t I suggest bringing reading material? The only reason I prefer reading a Kindle is because of how much less room it takes up. You can also store more than one book on it. You can take three books on holiday and take up no less room than one very thin book. Padlock. I haven’t needed to use one as of yet, but having a padlock handy is great for staying in hostels. Hostels are perfectly safe and usually, when I’m there, I don’t lock my stuff away. Anything super valuable I end up taking with me anyway and things that stay in the room are just clothes, food and toiletries. However, if you’re travelling alone or just want that little bit extra security, bring a padlock for any lockers or storage. Sometimes hostels provide them, but most of the time they cost to rent one. Travel adaptors. Almost nowhere has the same plug sockets as the U.K., but depending on where you’re staying, they may be able to sell you a plug adaptor for your country at reception. However, most countries in Europe have the same type of socket or are slowly changing to use the same as the rest of Europe, which means you really only need the ‘European’ plug adaptor. You can also get ones that contain multiple plug adaptors and USB ports too, which can sometimes be pricey, but are fab! Now, it’s time for your essential essentials. If you’re as paranoid as I am, your brain loves to tell you you’ve forgotten things. Cue you pulling everything out of your carry on to look for that one travel document at the bottom of your bag. So, for peace of mind, I bought this super dorky, yet super essential…bum bag. Amazon calls it a ‘travel money belt‘, and I guess you can say it has many differences to a bum bag. I mean, is there anything wrong with a bum bag? When I was at Reading Festival, everyone had one, from the colourful to the plain. But, I guess the largest difference between this travel money belt and a bum bag is that other people aren’t supposed to know it’s there when you’re wearing it. It’s supposed to go under your clothes where thieves and pickpockets can’t see it. I bought it in that sweet spot between panic that I was gonna get robbed, and more panic that I would just lose stuff myself. So, instead of using a bum bag that’s bulky and kind of just a large red arrow to all your essentials, I got the travel money belt, and it’s great. It’s quite thin, so it’s not for bulky items. It’s got two pockets however, one larger than the other, and fits passports, travel documents, tickets, and even headphones in quite comfortably. When walking through Rome after reading Wikitravel and reading about the problems with pickpocketing (hey, I’m an amateur remember? ), I felt so safe knowing that no one would be able to get close enough to me to steal anything important. I also took it to places that I knew pickpocketing wasn’t a problem, and used it more like a wallet for bus tickets and money so that I didn’t have to bring my whole purse with library cards and railcards and other things I didn’t need in another country. And that is about it! I’ve listed almost every single thing I take with me on a trip! Of course, you should tailor every piece of luggage to where you’re going, how long for, and if you’re putting luggage in the hold. For me? I keep it light, I keep it accessible, because one day, I would like the amateur in me to become a bit more of a pro. One day. Not any time soon, probably. 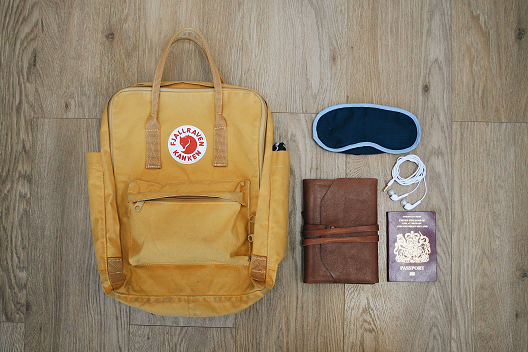 When you’re travelling, what’s the one thing you have to take with you?